Trying to sleep during the summer months can be a miserable experience. With temperatures soaring long after the sun sets, you want to keep cool. But your mattress might make you even warmer, waking you up drenched in sweat. Forget lightweight sheets – you need a new, cooler mattress. When you sleep hot, you can’t get the rest you need. Fortunately, a host of new mattresses are making summertime sleep cooler and more comfortable. Made out of materials that provide superior cooling, these mattresses help you achieve the perfect temperature for sleep despite the heat. Here are the top mattresses for staying cool this summer. The Dreamfoam Ultimate Dreams EuroTop Latex Mattress is built to cool. It contains a 3-inch top layer of cooling Talalay latex covered by a lightweight, breathable bamboo fiber fabric. The latex layer sits on a base of 8-inch high-density foam to provide support, and the specially designed Talalay latex provides superior cooling for hot sleepers. Want to customize your mattress? You can remove the comfort layer if you choose. When you order your mattress, you’ll also be able to customize your level of firmness. This mattress comes with a 120-night free trial and a 10-year warranty. The PangeaBed™ Copper Mattress is a 10.5-inch mattress constructed of four layers. The top layer is a soft quilted foam cover. Underneath it, you’ll find a layer of 100 percent pure Talalay latex that is infused with copper to lend the mattress its cooling and antimicrobial properties. The next layer is a cooling gel layer. Finally, the base layer is made out of dense foam to provide support. With so many layers of cooling material, you can stay cool and comfortable all night long – even after your body temperature warms up the mattress. The PangeaBed mattress comes with two free pillows and a 10-year warranty, as well as a 100-night trial period. For hot sleepers who are on a budget, the Casper Essential may be a perfect choice. It’s comfortable, breathable, and affordable at just $600. The bed is made out of three layers of foam, with a top layer made of a soft foam with open cells to allow for good cooling properties and easy airflow. Beneath that layer is a layer of cushiony memory foam. Finally, the bottom layer is constructed of dense foam to give you support. The mattress has a zip-off removable cover made out of upholstery grade material. You can give the Casper Essential a try; it comes with a 100-night trial and a 10-year warranty. The GhostBed Luxe is a 13-inch mattress that contains a cover layer that is made out of a proprietary phase change material, which helps to trap heat so that you can sleep cooler. Beneath that, there is a half-inch fiber layer and a 1-inch gel layer. Next, there is a 2-inch gel memory foam layer. Next, a transition foam gives the mattress bounce. The base is a 7.5-inch layer of high-density foam to provide support. This bed has multiple cooling properties and it even feels cool to the touch. It’s a great choice if you’re willing to spend a little to save yourself from summer’s heat. The GhostBed Luxe comes with a sleep trial of 101 nights and has a 25-year warranty. The Loom & Leaf mattress by Saatva contains gel memory from and air channels to help you to keep cool while you sleep. It has a quilted cover made out of organic cotton. In the back area, the mattress contains a proprietary spinal cooling gel to provide spinal support and cooling while you sleep. The next layer is a 5-lb cool memory foam with cooling properties. Lastly, a breathable layer of foam that has air channels to enhance cooling sits at the bottom of the mattress. The company offers free delivery and set up in your home if you live in the contiguous U.S. or Canada, and Loom & Leaf will also take away your old mattress for you. Don’t suffer through summer heat on your old, traditional mattress. Today’s newest mattresses are designed for maximum comfort – especially if you choose a specialty cooling mattress featuring gel, airflow, and breathable materials. Before you settle on a new mattress, research all of the available options. 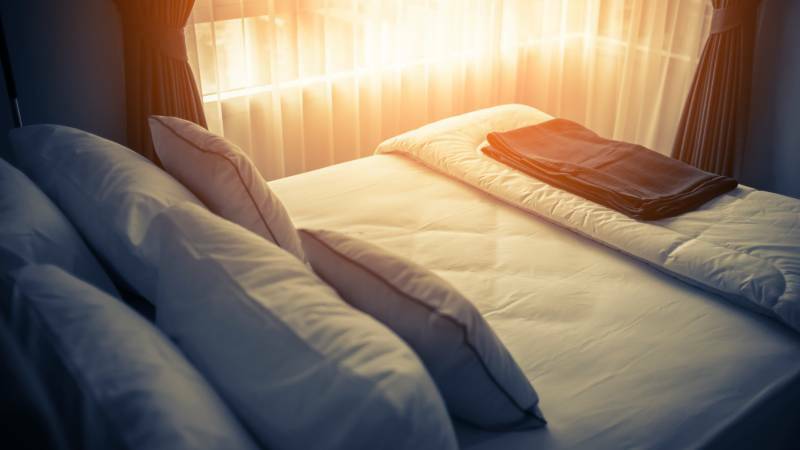 Learn what’s inside each mattress, check out its price and any available deals, and determine whether or not it can truly keep you cool. A little research goes a long way in sleeping comfortably and coolly in the hottest months. Interested in the latest mattress options? Start a search today.